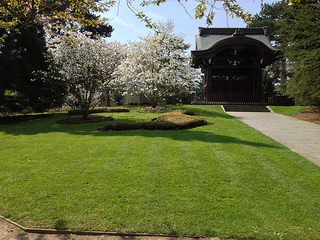 Today I went back to the Japanese Landscape: it was a gorgeous sunny day and the grass is starting to grow fast, so we had to mow the lawn. There is a specific department that takes care of the sward at Kew with ride-ons, but for the smaller areas we use lawnmowers. My parents' garden was sizeable when I was growing up, and the lawn was mowed regularly, I probably even had a go at times. 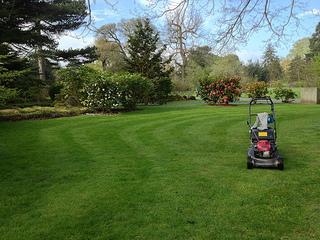 But it was just a matter-of-fact operation, to cut the grass short so that we could use the garden... here in the UK, however, lawn mowing is more of an art, and stripes are the height of perfection. So, today I was taught how to mow a lawn the proper way, and, for the task, I had a real star trainer, who gained his experience on golf courses. With great patience on his part, and some frustration on mine, the morning was well spent, and I even had fun once I started getting the gist of it. In the afternoon, I helped a colleague clear some leaves from a wooded area of the garden that I had never visited, and that turned out to be very pleasant with a selection of fragrant Magnolia species and a tree I had never seen, Azara microphylla, which gives off a chocolatey scent.